After almost 2 years of general dissatisfaction, creative slump and re-orientation, I have decided to kill my previous label-effort and start fresh with a smaller, more focused approach. The new imprint is called Lead Lozenges and will focus on noise and experimental sound art as well as graphic art in print, animated video and multi-media explorations. Releases will be curated differently, artwork will be handled differently and communication will look different as well. A mailing list will be set up for people interested in the output. No separate website will be created, no bandcamp will be set up, no web-store will exist. 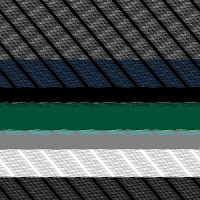 I want to get to a point where I can connect with people in a more direct fashion - therefore releases will be distributed differently as well. I will focus on trades and exchange of material rather than creating paypal-buttons. More information on this will follow as time progresses. Mixer feedback, cassette recorder feedback, pedal effects. Noise. 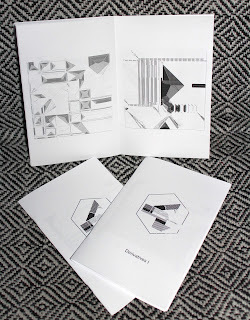 The first Lead Lozenges Print Edition (Zine) has now also been completed and is available. Once again, and particularly for this item, I encourage trades of all sorts. Email lead.lozenges@gmail.com for further information. Deutsche Asphalt will be stocking a few copies of Coerce II for distribution in Europe. All that look very nice! Sending you email soon! Please note: Initially there was not supposed to be a website for the label - there is now - link can be found in the signature. Yoosin Kim currently lives and works in Seoul and Sokcho, South Korea. Kim creates sound works inspired by irregular nature sounds and showcases the sublimity of these captured snippets of the environment he lives in. He creates audio-visual performances with quartz composer and unity engine. Aside from his visual art practice Kim is currently producing the documentary "The draft line" in Sokcho. He utilizes the sounds and videos from this documentary for his live performance. After two digital-only releases through South Korean imprint and arts collective Dingndents, Kim now delivers 4 tracks of dense, serrated musique concrète that hover on the doorstep into noise at all times. Over the course of Ss4K, Kim manages to construct eroding sonic patterns that stream forward from the darkness and loop around digital debris like a moth around a source of light that only serves to burn its wings. Artist copies will be on their way to Yoosin shortly. SkruntSkrunt is Abram Hindle from Edmonton, AB, Canada who told me the following when questioned about the tracks he delivered for his contribution to Lead Lozenges: "I was looking at the wave forms of tracks from all sorts of noise-releases and I noticed that they're all clipping. So I figured, I would do the same." Delivering 20 minutes of harsh noise straight from a live coding environment, Hindle continuously pushes the boundaries of what noise and experimental sound art can be. In this case it is garbled voices, cut ups, sheets of processed white noise, pet sounds, mumbling, screams and other wizardry. SkruntSkrunt has managed to consistently alienate audiences in western Canada and the United States by involving them directly into his performances of inclusive nerd-hullabaloo - Clipped Bus is just that - on a tape. Abram is currently traveling but will have copies upon his return. Rohverschnitt A is a result of K.M. Toepfer's recent experiments with the manipulation of image data, conversion of image files into raw data and subsequently into audio data. An attempt is made to explore concepts of symmetry and asymmetry when abstract imagery morphs into sound. 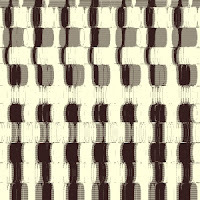 Semi-predictable rhythmic noise patterns are in essence directly derived from graphical abstractions and the application of glitching-methods in a semi-controlled environment. Only minimal editing and mastering of the resulting sound files has been performed. Tape saturation adds a welcome layer of grit to these recordings which can serve as an illustration of slightly compromised regularity - listen for artifacts and anomalies within that which suggests predictability. I am open to trades for any and all of these. ALL PURCHASES CAN BE ARRANGED BY SENDING AN EMAIL TO THE ABOVE ADDRESS. Just replied to your email. Thanks. Hemant Sreekumar from Bangalore, India got involved with noise in 1986 when he started self-hypnosis using television and radio static. He embroiders coded computational processes to create sonic situations. His compositions deal with notions of measurement, decay, data sonification and stochastic emergence. On "Divided By Zero", he dives head first into a dark, brooding sonic vision for a desperate future society. Ritualistic, churning rhythmic noise envelops the listener and paints vivid pictures of a colorful, dangerous maze of endless disorienting repetition, digital dependency, over-analysis and empty technology-worship. Radical minimalist reduction is the foundation of these 3 tracks, spiraling patterns and hypnotic stomping building blocks that are rounded out by mysterious chants - those of the machine and the end user. Hemant Srekumar is also responsible for the art on this release - each cover image is different - take your pick. Rohverschnitt B is the second part of K.M. Toepfer's ongoing exploration of image data sonification. Similar to Rohverschnitt A from 2017, the material on this tape is constructed from image data which is converted into raw data and from there into sound files. This time around the focus is on stacking multiples of the same image and through this process creating loops of glitched rhythmic patterns and cyclical waves across the stereo field. Multiple movements are contained within each of the 2 tracks on this tape to keep you guessing. Rohverschnitt B is unpolished process music based on fluid repetition, sharp cuts and odd pops - what's in the damn picture? All tapes are 7 $ CAD. Here's hoping winter treated all of you well. Artist copies are en route to the artists as well - consider picking up your copy from these fine folks. A selection of Lead Lozenges releases (LL5, LL6, LL7, LL8) has been mailed to the Skeleton Dust Records store in Dayton, OH - a few copies from the new batch will also go to Scream & Writhe in Montreal, QC.